Contribution of Articles to the Aviation History On-Line Museum are courtesy of Aviation Heritage. 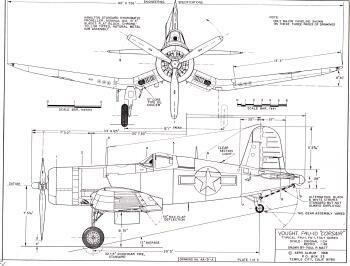 To the ears of American G.I.s clawing their way off the bloody beaches of Okinawa in April 1945, the sweetest sound in the world was the whistling war cry of a strangely proportioned aircraft called the Vought F4U Corsair. The most important naval attack fighter of WWII, the Chance Vought Corsair remained in production for thirteen years. 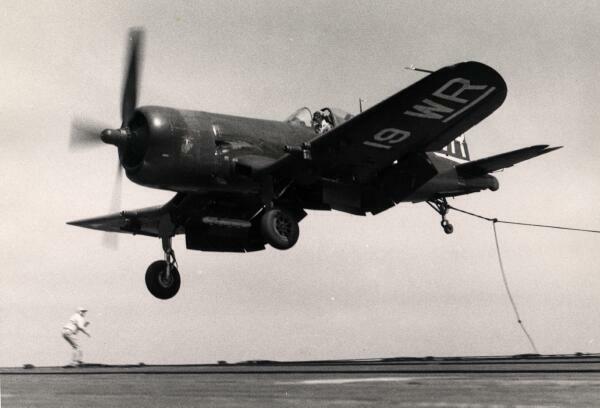 The Corsair's most unique feature was the "bent" wing, the result of a marriage between the most powerful engine ever installed in a piston-engined fighter and one of the biggest propellers in the world. 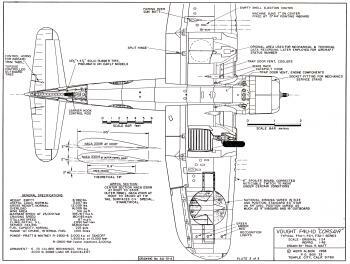 The inverted gull wing permitted the short, sturdy undercarriage required for carrier operations, allowed a low drag, 90 degree wing-fuselage junction, gave the pilot better visibility over the wing and lowered the overall height of the folded wing. 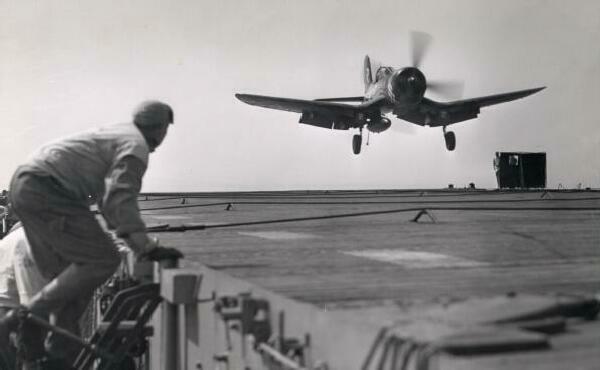 The Corsair's distinctive sound, which earned it among the Japanese the nickname of "Whistling Death", was caused by the wing-root inlets for the engine air. A production contract was awarded to Chance Vought in June 1941 and the first production machine flew in June 1942 with a top speed of 415 mph, a sea-level climb rate of 3,120 ft/min and a service ceiling of 37,000 ft. The first carrier trials were carried out in September 1942 aboard the USS Sangamon. Despite the hundreds of detailed demands contained in the specifications for the new fighter plane, the major design objective was speed - - and more speed; everything else was secondary. From the start of its design in June 1938 the paramount demand on the Corsair was that it be the fastest fighter ever built and this goal was achieved when the new plane became the first in the world to exceed 400 mph in level flight with full military equipment. Two things are required to create the rare environment in which a seemingly ageless airplane can exist: 1.) It must be a very good airplane; and 2.) The peculiar economic or tactical situation into which it was borne must persist. 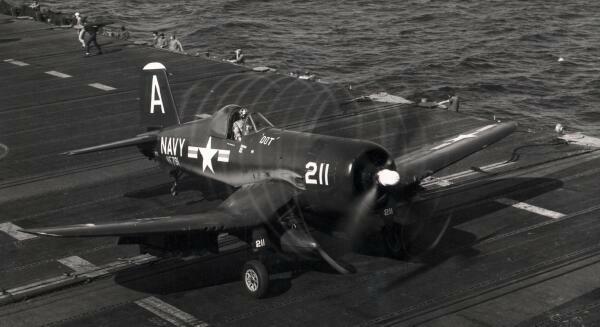 The Vought Corsair met both of these environmental tests. It was one of the fastest propeller-driven airplanes in the world and its unmatched versatility included close air support abilities vital to a successful war effort. The F4U Corsair was one of the great fighter plane designs of WWII. A rugged piece of flying machinery, it had the most durable production of all fighters of that day. 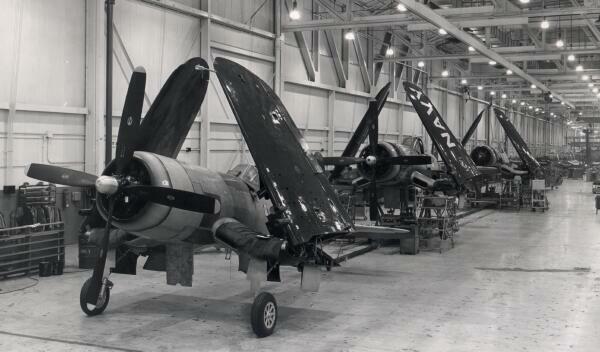 From the first prototype delivery to the U.S. Navy in 1940, to final delivery in 1953 to the French, 12,571 F4U Corsairs had been manufactured by Vought. 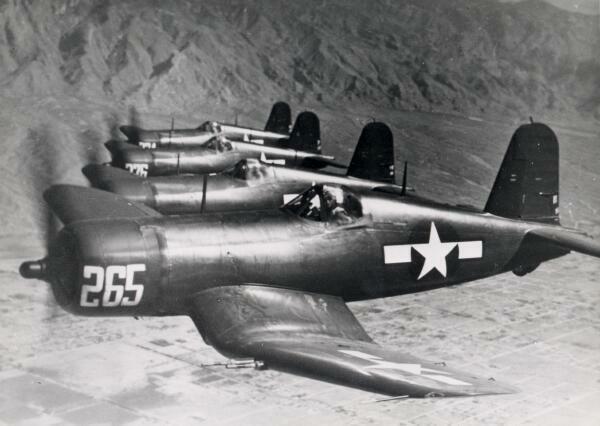 First ordered into production in the fall of 1941, the Corsairs appeared in time for the bitter struggle in the southwest Pacific from Guadalcanal to VJ Day. 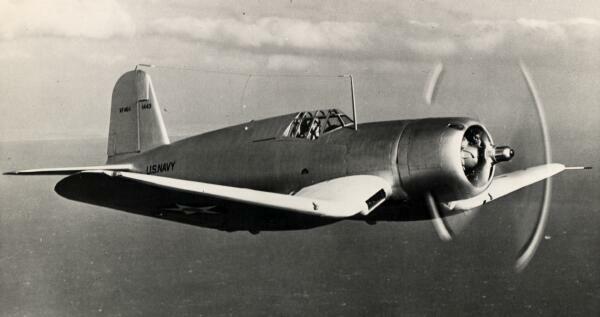 Until late 1944, both Navy and the Marines had used the Corsair as a land-based fighter. In the final year of the war, the Corsair began operations from aircraft carriers, where it speedily ran up new spectacular scores. F4U of VF-791 makes a series of vapor rings as it starts its take-off run laden with bombs from USS Boxer, CVA-21 in Korean waters, July 6, 1951. 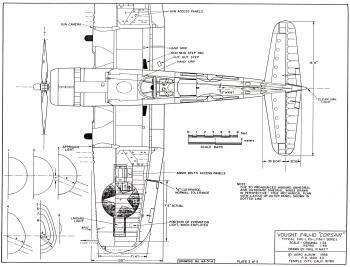 The Vought Corsair is forever engraved in aviation history as the last - - and the finest - - propeller-driven combat airplane. Each of the services made an airplane great in WWII and history can never forget the Air Force's Boeing B-29 Superfortress, the Navy's Grumman F6G Hellcat and - - most certainly the Marines' Vought F4U Corsair. The above two Paul Matt Scale Drawings are samples (quality on this page is diminished) of 124 types of airplanes (325 drawings) with 3-views drawn by Paul Matt. Get a complete list of Paul Matt Scale Drawings at our Online Store. Paul's 3-views are available in 3 formats: Individual drawings, 2 books, or 4 CDs (with hundreds of photos each). 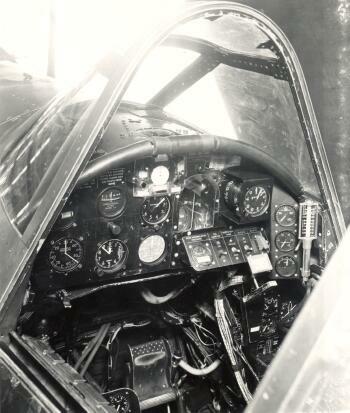 The above photos and thousands more are available on our Aviation Heritage Airplane CDs. © The Aviation History On-Line Museum 1999 All rights reserved.